Pearl and I watched this film the other night, and I have to blog on how bad it is. It is frighteningly awful. 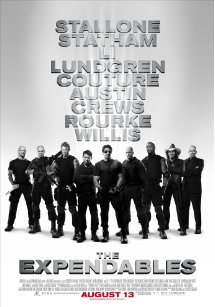 It’s cast read like a ‘who’s who’ of action movies including Sylvesta Stallone, Jason Statham, Jet Li, Dolph Lungren, Mickey Rourke, Bruce Willis and Arnie. It’s as though the Mona Lisa had decided that as her pictures so popular she can probably knock up a few self portraits herself, and do without the stroppy painter. We started to get suspicious after the leading men are variously seen on various expensive looking motor cycles and parking them in a cool looking sort of macho man hang out complete with neon signs and pool tables, where they sit and sharpen knives, and give words of wisdom to each other (like the building that Wesley Snipes hangs out in with Kris Kristofferson). Then suddenly they’re whisked off to some representation of a tin-pot country somewhere, where generic looking bad guy soldiers rough up the populace, except they’re not all whisked off they seem to have suddenly found a sea-plane and can all fly – oh and it has a huge machine gun in the nose and drops kerosene bombs. Then there’s suddenly a love interest who needs saving which a 70 year old Sly looks really creepy chasing after. Then CIA involvement and then we had to turn it off because we couldn’t watch any more. It was just the most awful film ever made. Categories: Musings | Tags: Film, Sylvesta Stallone, The Expendables | Permalink.